Simon Grayson has challenged his players to push their unbeaten four-match Championship run into double figures and keep Leeds United “in the pack” in the build up to Christmas. Grayson is looking for a concerted run of consistent league results after a strong surge through September helped United recover from their worst start to a domestic season for 14 years. Leeds have taken 10 points from their last four matches, culminating in a 1-0 win over Portsmouth last Saturday, and the form took United into the international break in 11th position, with a game in hand over all 10 of the sides above them. The club’s resurgence failed to earn Grayson a nomination for the September manager of the month award – the Championship’s four-man shortlist featured Southampton’s Nigel Adkins, Middlesbrough’s Tony Mowbray, Cardiff City’s Malky Mackay and Hull City’s Nigel Pearson – but the past month has alleviated pressure caused by a series of poor results in August. Grayson warned of an unpredictable campaign ahead, claiming that the early stages of this season had proven that “anyone can beat anyone”, but he believes United are well-placed to put themselves in contention for promotion at the turn of the year. Grayson said: “We’ve seen from results in this league that anything can happen and anyone can beat anyone. “You’ve got to be consistent in your own results and put together runs of eight or 10 games unbeaten, just to keep you in the pack. 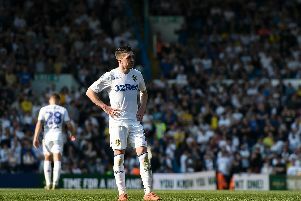 Leeds resume their campaign a week today against Doncaster Rovers, a team who spent much of the term inside the Championship’s relegation zone.